Linear motion shale shaker is a high efficiency screening equipment, it can effectively separate solids from drilling mud, linear motion shale shaker is widely used in mine, coal, smelt, building materials, fireproofing and chemical industries. 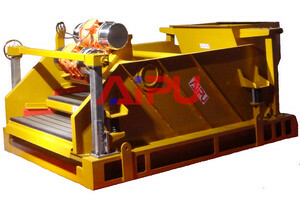 Aipu drilling fluid linear motion shale shaker is especially effective while drilling top-hole sections where heavy and high-volume solids are usually encountered. In these intervals, drilling shale shakers may generate powerful G-forces and its effective vibrating motion can quickly remove the dense solids from screens and particles from wells. Linear motion shale shaker is made of hydraulic lift device, vibration motor, explosion-proof switch, foundation, logging tank and screen. It uses double vibration motor, when the two sets vibration motor do the synchronization and contrarotation, the exciting force is produced by eccentric block is cancelled out with direction of parallel with motor shaft line and fold a resultant force with the direction of perpendicular to motor shaft. So the motion of screen machine is linear. There is a dip in the sifter where is the two motor shaft relatively, in the resultant force of exciting force and gravity the material is throw and do linear motion movement to reach the aim of screening and grading. Usually the modern shale shakers are high speed, linear, fine mesh, multilayer shale shaker. It plays the important roles in solid phase control system. Adjustable discharge angle during drilling. Reliable and great performance at a competitive price. Welcome to Aipu solids control to inquire drilling fluid shale shaker. Our company will provide you the high efficiency shale shaker and other related solid control equipment at superior quality and most reasonable price. How to improve jet mud mixer working efficiency?